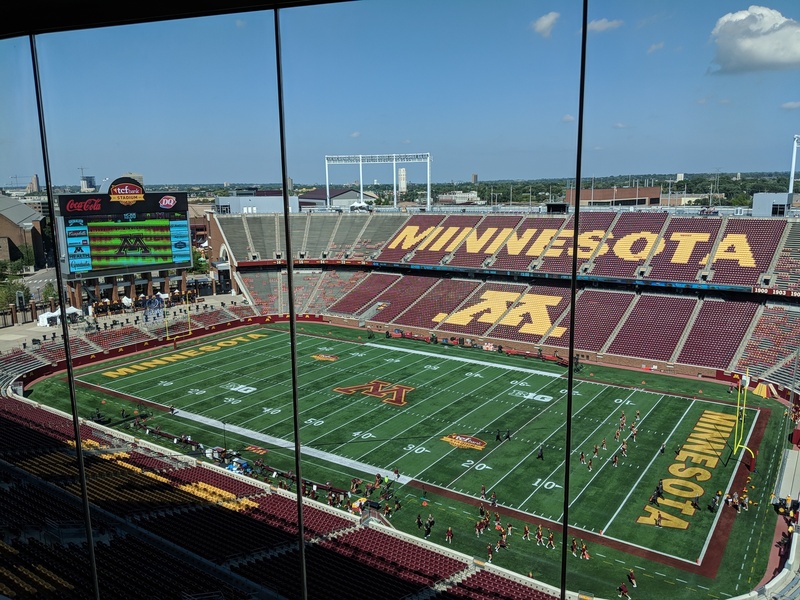 Good afternoon from a hot TCF Bank Stadium, where the Gophers face Miami (Ohio) at 2:30 p.m. (BTN) in their final nonconference game. Temperatures are forecast to hit 90 during the first quarter, and the National Weather Service has issued a heat advisory that runs from 1 p.m. to 6 p.m., with heat indices of 95 to 100 degrees. With these conditions, expect to see both teams dip into their depth to keep players fresh. The Gophers are seeking a 3-0 start for the second consecutive year, and that would make P.J. Fleck the first Gophers coach since Alexander Jerrems in 1896 to start his Minnesota career 3-0 in back-to-back seaons. As has been the case in the first two games this season, the Gophers today will rely on true freshmen in key roles. I wrote about four of them – QB Zack Annexstad, WR Rashod Bateman, RB Bryce Williams and CB Terell Smith – in today’s Star Tribune. Thompson began his career with a bang, rushing for 205 yards and four TDs in the 1986 opener against Bowling Green. The size and strength of college players compared to those in high school caught Thompson’s attention immediately. The mental aspect of the college game, especially the attention to detail, was an adjustment, too. “The terminology was a lot more, and everything is broken down,’’ Thompson said. “No one ever talked to me about my footwork in high school. When I got here, it was, ‘Oh, no. Your first step’s gotta be here, and your second step here, and your third step …’ I never had someone talk to be about, here’s where I should be, you’ve gotta read the nose, gotta read the linebacker. I just kind of ran around and ran the ball. Eslinger recalled finding out that he would start in the 2002 opener against Southwest Texas State by reading it in the Star Tribune the morning of the game. At 245 pounds, he considered himself too light at the time to play center. But he quickly made an impact, earning freshman All-America honors from The Sporting News. Eslinger said the fact that fellow true freshman Mark Setterstrom was starting next to him at left guard helped in the adjustment. Eslinger credits upperclassmen Jeremiah Carter and Joe Quinn, along with coach Glen Mason and offensive line coach Gordy Shaw, for their leadership.